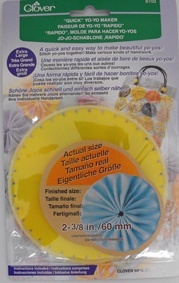 Quick" Yo-Yo Makers allow you to make evenly spaced stitches to create beautiful gathers. Fold the seam allowance, rounding off to make a nicely shaped yo-yo.<br> Use in various Handiwork and Crafting.<br> <br> All yo-yo's come complete with detailed instructions.<br> <br> Finished size: 60mm (2.3/8 inch)<br> <br> Quick and easy way to create beautiful decorations for home decor, accessories, gift wrapping and greeting cards. Quick" Yo-Yo Makers allow you to make evenly spaced stitches to create beautiful gathers. Fold the seam allowance, rounding off to make a nicely shaped yo-yo. Use in various Handiwork and Crafting. All yo-yo's come complete with detailed instructions. Quick and easy way to create beautiful decorations for home decor, accessories, gift wrapping and greeting cards.